Stunning views from number 8 compete with some gorgeous additions inside completed winter 2016-2017. Starting with superb new windows throughout including two fabulous new patio doors to the lounge dining area leading out onto the balcony and those views to die for! New wood style flooring throughout the lounge kitchen diner and hall as well as both the bathrooms and contemporary bath in the family bathroom completed the refurb. It is important to advise you that The Narracott Hotel which is adjacent to the apartment end is undergoing refurbishment work to convert the old hotel to apartments. We have now been advised that the works should be completed by the end of May 2019. The works started a few years ago and don't affect the three apartments we manage here or their views but we feel it necessary to let you know. There is also a YouTube Flythrough of the Byron Development of The Narracott in Woolacombe which can be viewed here. I am delighted to offer this apartment that really has a combination of the two most sought after features in Woolacombe, a great view over the beach and yet right in the centre of the village to enjoy the best of both worlds. This incredibly sunny spacious apartment has a west facing open plan living area with a large veranda balcony out of two relatively new double patio doors making the room so light and bright. 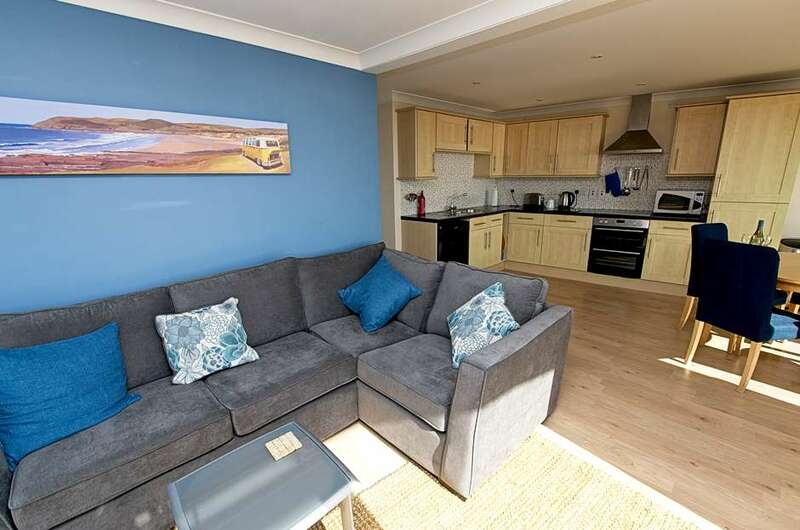 There are two good size bedrooms making this a great choice for a family holiday in Woolacombe. The floors in the lounge, kitchen diner, hall and both bathrooms were replaced to wood style in the winter of 2016/17. The smart grey fabric corner sofa added in 2017 gives a comfortable place to sit and take in the magnificent views. There is a TV, DVD, Digital radio and games and DVDs. Free Wi-Fi is also available (please note this is not unlimited so please be sparing with useage ). Beech coloured kitchen units house full size dishwasher, fridge, freezer, oven, hob and hood. There is a microwave and a good selection of utensils and crockery. The hallway has coat hooks, shoe store and a “useful” cupboard housing the washing machine (not dryer), hoover, iron, ironing board etc. In the master bedroom there is a king size bed, wardrobe, chest of drawers and TV/DVD. The en-suite has a really good size shower, WC and basin. The twin bedroom has two 3ft single beds, one with a trundle bed under for occasional use and wardrobe with drawers incorporated. The family bathroom has a contemporary double ended bath, shower over with screen and glossy bath panel. WC and sink basin in white. Surfboards can’t be taken into the apartment itself but can be laid in the corridor just outside the apartment door. 8 Narracott Apartments has a foreign holiday feel as it is sunny and bright and in the hub of this special holiday village.